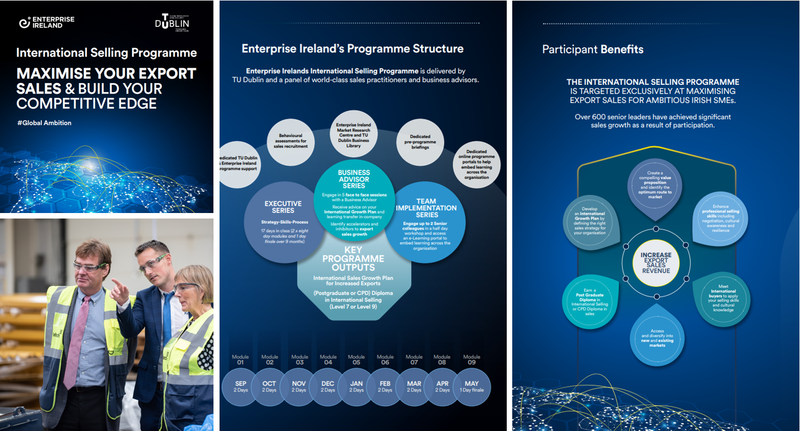 For any Enterprise Ireland client companies considering participation in the International Selling Programme (ISP) run in conjunction with TU Dublin, as a past student I can from experience give it the highest of recommendations. In the 6 years since my participation on this 9 month programme Keltech have over doubled our sales. Growth has mainly been driven by entry into new “untapped” international markets including Germany, France & Belgium. The ISP provides students and their companies with a best in class sales approach. The areas of : Customer Sweetspot Analysis, Pain Diagnostics, Pipeline Management & Growth Hacking have been and continue to be key characteristics of our sales technique. Quickly after joining Keltech in 2012 I recognised this was a company with huge potential. With an excellent facility, machine profile, a highly motivated and experienced staff all of the “success ingredients” already existed. There was a great story here to tell, it was just about how we should tell it! The ISP provided me with the perfect launch pad, it allowed me cut through some of the fuzz and deliver a message to our customers that was; concise, exciting, engaging and timely; the rest is history.